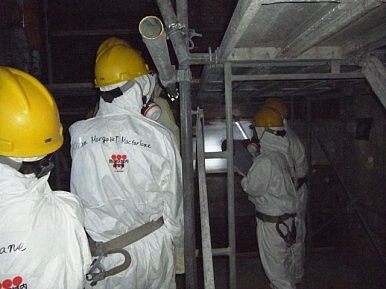 An inspection of Reactor 4 at the Fukushima Dai-ichi nuclear complex in December 2012. Can South Korea Lead Nuclear Cooperation in Northeast Asia? Seoul faces significant challenges in its push for greater collaboration, an expert warns. South Korea faces significant challenges as the Asian power tries to lead nuclear safety cooperation in Northeast Asia, a scholar said Tuesday. Yet the Fukushima incident was a reminder that there are still a number of unresolved issues related to nuclear power, Platte, who is now a visiting fellow at the East-West Center, a Washington, D.C-based think tank, said at an event there. While nuclear safety was the issue in that case, other concerns remain with respect to proliferation as well as nuclear waste management. In theory, these challenges open up room for potential collaboration. “There is a lot of opportunity for cooperation,” Platte said. Realizing this, South Korea under President Park Geun-Hye has pushed for nuclear safety cooperation as one of the “soft issues” to build trilateral cooperation with Japan and China under the Northeast Asia Peace and Cooperation Initiative (NAPCI) launched in 2014. The nuclear safety component of NAPCI called for a new meeting on nuclear safety – the Top Regulators’ Meeting Plus (TRM+) – to widen consultations between nuclear safety regulation authorities of Korea, Japan and China to include new members like the United States and Russia. In addition, in an important speech in August 2014, Park also proposed that a new consultative body for nuclear safety be created in Northeast Asia modeled on the European Atomic Energy Community (EURATOM), a multilateral cooperation framework that grew out of emerging regional integration which started with the European Coal and Steel Community. The goal would be to begin with trilateral cooperation but broaden it out to include other regional states as well as major powers. “Korea, China and Japan would spearhead the effort, with participation open not only to the United States and Russia, but also North Korea and Mongolia,” Park said at the time. But Platte, who was previously a nuclear security fellow at Harvard University, said these initiatives face significant challenges. For one, in general, there is a tendency for South Korean presidents to push for grand visions for regionalization and integration in Northeast Asia which are eventually followed through by successive administrations. Any serious commitment to regional organizations would need to be carried through past this administration, he stressed. “Making a plan every five years for regionalization is not a good way to achieve regionalization,” Platte warned. Even if the idea were to be seen through, there is the question of how it would be received. As of now, Platte admitted there was a lack of in depth knowledge of the initiative among Asian states, which is partly due to its vague nature. There is also the separate question of whether Japan or China would willingly embrace a South Korean initiative of this nature given the competitive dynamics between the Asian giants. “I don’t think Japan and China are buying into it,” Platte said. The specifics of the initiative – to the extent that they exist – are also still unclear. Regarding membership, Platte said that given the fact that trilateral cooperation was already so challenging, it was not entirely clear why it would make sense to broaden an initiative out to include other actors as well like North Korea, Mongolia, or Russia so soon. “If trilateral cooperation is so difficult, why do you open up to new members as well?” he asked. As for the idea of replicating EURATOM in Asia – a proposal that dates back decades – Platte said that this was very difficult to accomplish. Unlike Europe in the 1950s, Northeast Asia today lacks both the political trust as well as supporting institutions to back up such a grouping as well as to monitor and enforce binding commitments. To take just one example, it would be difficult to imagine having a cooperative nuclear regime to get access to Chinese nuclear sites. “I look at all these things and think that’s a tall hill to climb,” Platte said. But Platte argued that this was not necessarily a bad thing. There is already a whole alphabet soup of existing regional and international bodies that deal with some components of nuclear safety, including the Asian Nuclear Safety Network and the Convention on Nuclear Safety. As for safeguards, the International Atomic Energy Agency already sets a good standard for the region. Indeed, given all this, Platte said it was not clear what NAPCI’s specialization would be given these existing groups. Instead, he recommended decoupling nuclear safety from NAPCI altogether and letting trilateral cooperation on the issue proceed through the TRM process at the working level. He also suggested that countries focus more narrowly on the issue of emergency management within nuclear safety. The objective here would be to ensure coordinated information sharing – and perhaps even joint response readiness – between the countries in the event of another Fukushima-like incident. Focus on this area, he noted, was already evident in some of the recent TRM meetings. “This seems to be the most common area of interest among the countries,” Platte said. What’s Next for Indonesia-South Korea Military Ties in 2018? A closer look at what could be in store for defense relations this year.